It’s legal, but the Humane Society of the United States says testing being done on 36 beagles in Mattawan at Charles River Labs is abhorrent and immoral. 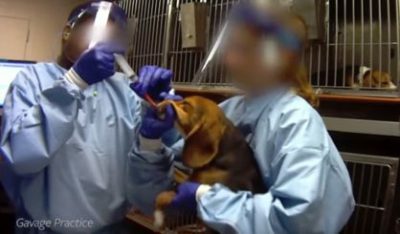 The nonprofit released video footage shot undercover at what used to be MPI Research of the dogs being force-fed a fungicide made by Corteva Agriscience, the agricultural division of DowDuPont. The Humane Society is calling for the beagles to be released, and has launched an online petition to try to force Charles River Labs to end the tests. The videos were shot over the course of 100 days last year, with more than two dozen experiments being done on the dogs during that time. Several reportedly died as a result. More information from the Humane Society can be found here, and their petition is available by clicking this link. Corteva Agriscience issued this statement upon the release of the video by the Humane Society: “At Corteva Agriscience, we care deeply about the welfare of animals. Consistent with industry practice, we conduct animal testing only when such testing is required by regulatory authorities, and we proactively engage with government officials to minimize or cease animal studies, where possible. “We agree that there are better ways to attain the data needed for this study and have been working closely with the Humane Society of the U.S. for many months to encourage Brazil’s Agencia Nacional de Vigilancia Sanitaria (ANVISA) to amend its animal test requirements for pesticides. While we have received an encouraging letter from ANVISA, that letter is not definitive. Once the industry receives confirmation that this test is no longer required, we will cease testing immediately and make every effort to rehome the animals. “Corteva Agriscience, Agriculture Division of DowDuPont, is committed to animal welfare and the 3Rs (Replacement, Reduction and Refinement) as core principles of toxicological research. Image is a screenshot from the undercover video released by the Humane Society.